Remember, Safety Begins With You! Always ski and snowboard within your ability and be aware of the people around you. Are you part of the team? Learn about our SAFERmtn Team and how we are working to create a safer mountain for everyone. 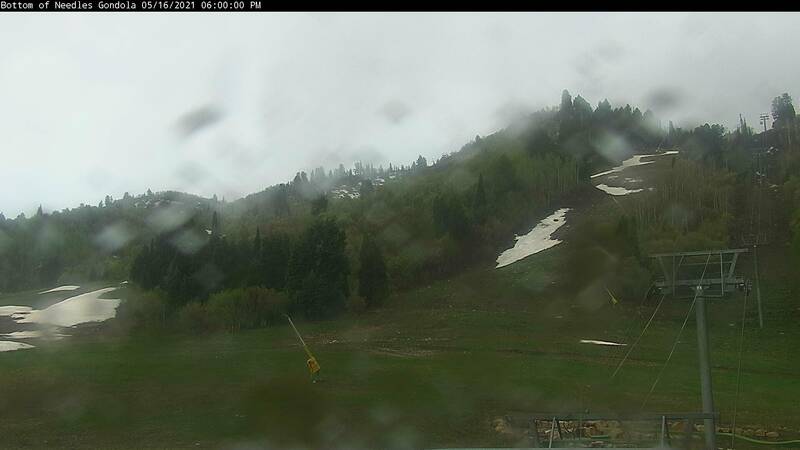 *Snowbasin has many acres of potential avalanche terrain. Watch for the orange and black Avalanche Area signs and rope lines. Do Not enter a Closed Avalanche Area. To access these areas when they are open, enter only through the open gates. Skiing in CLOSED avalanche areas is AGAINST the LAW and will result in a 30-day pass suspension. Violators may be cited with Class B Misdemeanor charges. 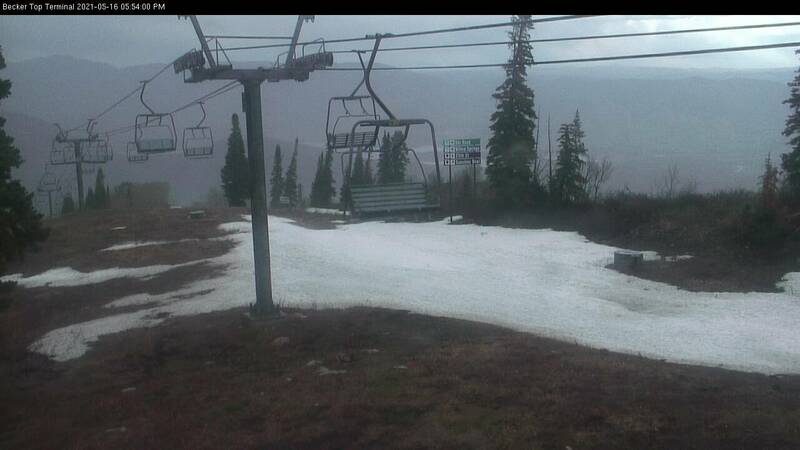 All passes will not be reinstated until the skier responsibility class is completed. The Snowbasin Ski Patrol staff consists of full-time and volunteer members dedicated to providing quality customer service and emergency first aid to our guests. We have Ski Patrol stations at John Paul Lodge, Needles Lodge, the top of the Strawberry Express Gondola, and Porcupine Chairlift as well as a location near the Grizzly Center in the base area. Contact Ski Patrol - Call the main dispatch number 801-620-1017 or ask any Snowbasin employee to contact Ski Patrol for you. Skiing can be enjoyed in many ways. At ski areas you might see people using alpine, snowboard, telemark, cross country or other specialized equipment such as that used by the disabled. Regardless of how you decide to enjoy the slopes, always show courtesy to others and be aware that there are elements of risk in skiing that common sense and personal awareness can help reduce. 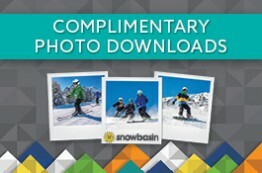 Observe the code listed below and share with other skiers the responsibility for a great skiing experience. Whenever starting down hill or merging into a trail, look up hill and yield to others. Always use devices that help prevent runaway equipment. Observe posted signs and warnings. Keep off closed trails and out of closed areas. Know the code! It’s your responsibility. We urge skiers and riders to wear a helmet – but to ski or ride as if they are not wearing a helmet. NSAA advocates skiing and snowboarding in a controlled and responsible manner as the primary safety consideration for all skiers and boarders. A skier’s behavior has as much or more to do with the safety of the sport as does any piece of equipment. In 2002, Lids on Kids debuted as a resource for consumers to learn about helmet use in skiing and snowboarding. This site contains FAQs about helmet use, fit and sizing information, general slope safety information, related articles and games, and testimonials about helmet use from well-known athletes, including US Ski Team members. The site has received nearly 2 million hits since it was created. The tagline, “A Helmet-It’s a Smart Idea,” is printed on posters and promotional cards at resorts nationwide. For more information, visit the Lids On Kids web page: www.lidsonkids.org. Using a chairlift or gondola while skiing, snowboarding, mountain biking, or even just sightseeing, is an exceptionally safe and secure mode of transportation. Nonetheless incidents and accidents can happen – especially when people are unaware of loading, riding and unloading procedures. Educate your children about loading, riding and unloading lifts. Be sure to emphasize courteous behavior and utilize these Tips for Responsible Lift Use to get your points across. Slope safety and personal responsibility should be discussed prior to hitting the slopes or using a lift. Keep in mind, when your child loads a lift chair without you, they may not always be riding with another adult. Remember, it’s your responsibility to know how to use and ride the lift safely as well as your child’s. Having the knowledge and dexterity to use the lift properly will ensure fun for everyone. 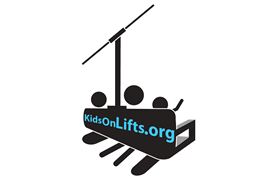 For more information, please visit kidsonlifts.org. In our commitment to safety, Snowbasin is pleased to present our Avalanche Rescue Training Center. 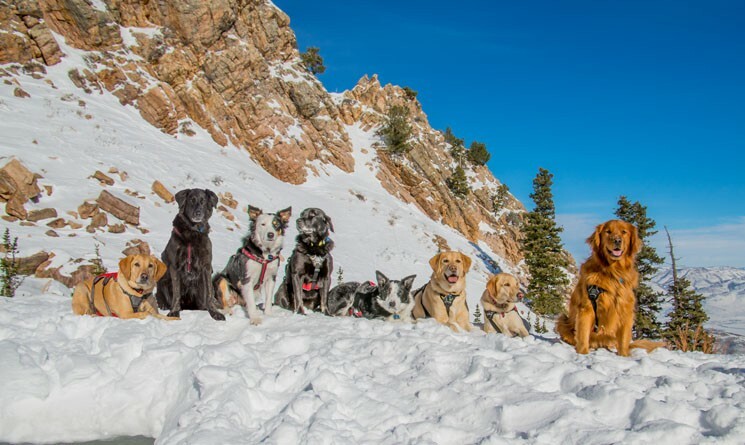 Built in cooperation with Wasatch Backcountry Rescue and the “Are You Beeping” and “Stay On Top Of It” public awareness campaigns, the center offers backcountry enthusiasts an opportunity to sharpen their rescue skills in the safety of a controlled environment. Located at the bottom on Herbert’s, the Avalanche Rescue Training Center allows users to practice finding one to four buried “targets” in the snow using their avalanche transceivers (provided by user) and probes (provided by Snowbasin). A flashing light and siren indicate when a target has been found, and the rescue time is displayed. The training facility is free to the public and is open daily from 9:00 a.m. to 5:00 p.m. The National Ski Areas Association and Burton Snowboards would like to welcome you to the “Smart Style” Terrain Park Safety initiative. The Smart Style video along with TerrainParkSafety.org work together to emphasize the importance of safety in terrain parks across the country. Please visit www.TerrainParkSafety.org for a comprehensive look at the Smart Style program. Uphill Travel Status is updated at 4:00 am each day to alert guests if the conditions are green or red and goes red at 9:00 am. Uphill travel is only open to skiers, snowboarders, and snowshoers. We DO NOT allow fat biking on our uphill route. RED DAY = No uphill traffic permitted (usually avalanche reduction days), if found on the mountain, there will be consequences. If you come to a sign that reads “Winch Cat Above This Point”, this ends your ascent. Do not travel around winch cats. Only approved routes are Powder Puff - School Hill - Bear Hollow - Sweet Revenge - Needles Lodge or Powder Puff - Snowshoe Road - School Hill - Bear Hollow - Sweet Revenge 0 Middle Bowl Traverse - Porcupine Traverse - Strawberry Traverse - Needles Lodge. 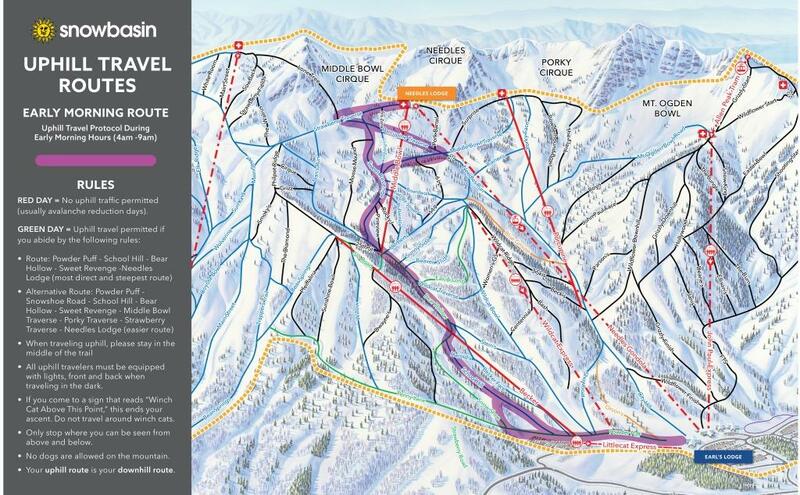 Use the same route downhill unless the mountain is open after 9:00 am. All uphill travel must cease by 9:00 am. Please do not go off the approved route, if found off the approved route there will be consequences. This is for everyone’s safety. The cache road that accesses Strawberry from Snowbasin Road IS ONLY for Employee Travel. Yield the right of way and stay clear of ski area machinery, i.e. grooming machines, snowmobiles, and snowmaking equipment. You are responsible for your own safety. Expect to always encounter ski area machinery and employees at any time and anywhere on the mountain. Mountain users should wear reflective clothing, headlamps and blinking lights on front and back. No pets allowed on the mountain. Adhere to Trail/Avalanche Closures. No person except a member of the ski patrol, an employee of the Forest Service, Sheriff or ski area operator employee working in the course and scope of his employment shall enter or go upon any closed area. If you pack it in, please pack it out. Help us keep the Forest clean for future users. As Partners in Recreation with the US Forest Service, Snowbasin Resort’s Uphill Travel Policy allows access for uphill travelers (i.e. hiking, snowshoeing, skinning, etc.) under certain conditions. Across the country, increasing uphill traffic within ski area boundaries has driven the implementation of uphill policies. While uphill travel within ski area boundaries may seem innocuous, it poses significant safety risks and concerns for uphill and downhill recreationalists, ski area operations and ski area staff. 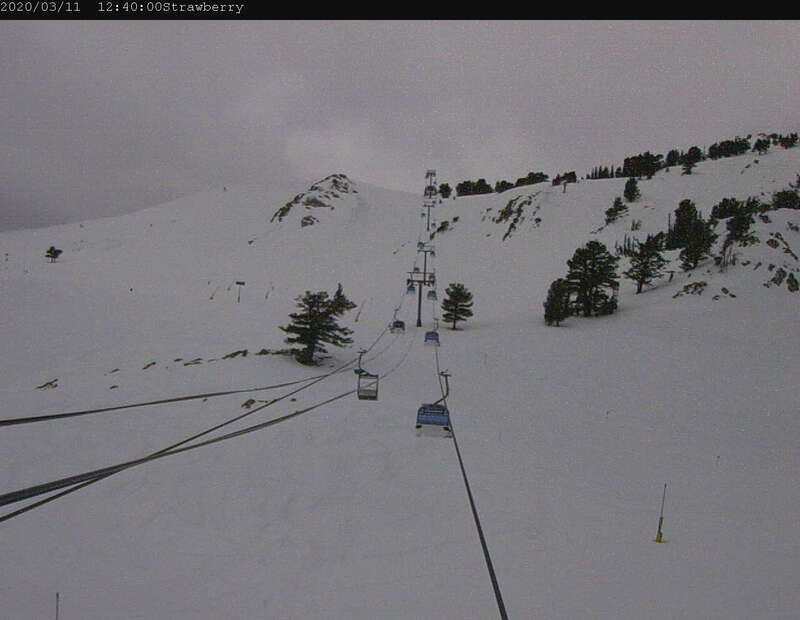 For this reason, uphill travel is not permitted in any fashion at many ski areas. Snowbasin Resort’s policy reflects our commitment to seek a balance between mitigating safety concerns of uphill travel as a recreational use within the downhill ski area/Special Use Permit area with the reasonable needs of operating a sustainable and successful alpine ski area, for which we have been granted a Special Use Permit from the US Forest Service. Snowbasin Resort continues to work closely with the Ogden Ranger District, Uinta Wasatch Cache National Forest, and local organizations, to build awareness and provide public education regarding uphill travel and recreational uses. Our goal is to find a reasonable balance between and among user groups who share a common interest in recreating within the Snowbasin Special Permit area in a non-confrontational and sustainable manner while establishing safety rules for users designed to reduce the hazards and dangers related to such usage. Your uphill route is your downhill route. All uphillers need to turn around at 9:00 am. Uphill Travel Status is updated at 4:00 am each day to alert guests if the conditions are green or red and goes red at 9:00 am. Uphill travel by the way of foot, snowshoes, trax, or skis is not allowed between the hours of 9:00 am and 4:00 am of the next day unless the resort reflects green status. Outside of operating hours, there may be circumstances in which the ski area may prohibit uphill traffic, or limit or restrict uphill traffic by designating specific times, days or routes that will be available for such use. These circumstances might include safety, maintenance or operational needs; grooming operations; snowmaking operations; special events; avalanche hazard reduction work; wildlife or resource considerations; or other reasons. The ski area is authorized, with Forest Service pre-approval, to perform any or all of these actions as deemed reasonable and necessary by the ski area. 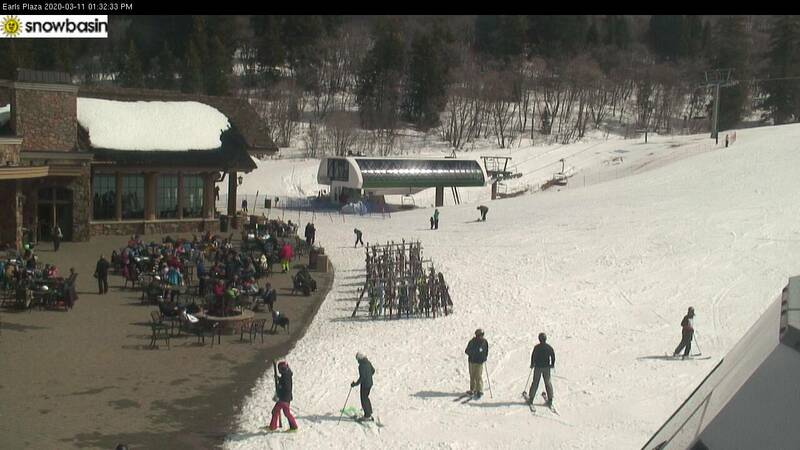 There is no ski patrol available outside of normal operating hours. You are responsible for your own safety and rescue. 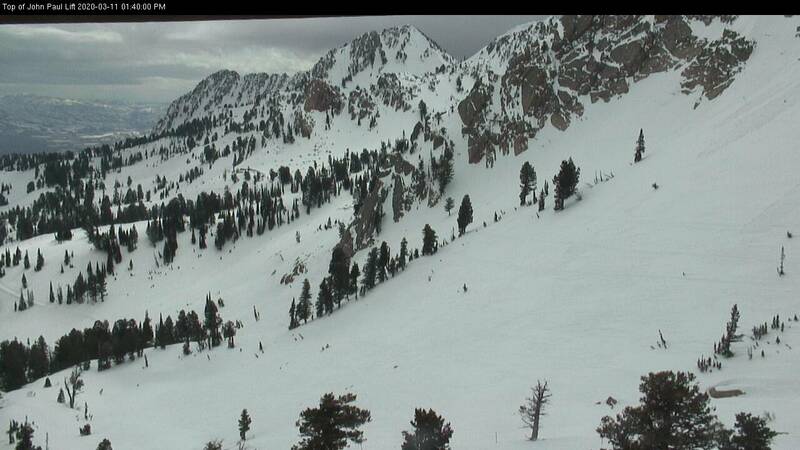 All participants within the permit boundary are considered skiers and are subject to Utah Skier Safety Act. Daily updates of current uphill travel restrictions (RED DAY/GREEN DAY) will be posted within the snowbasin.com mountain report as well as listed on the (801) 620-1100 snow phone. 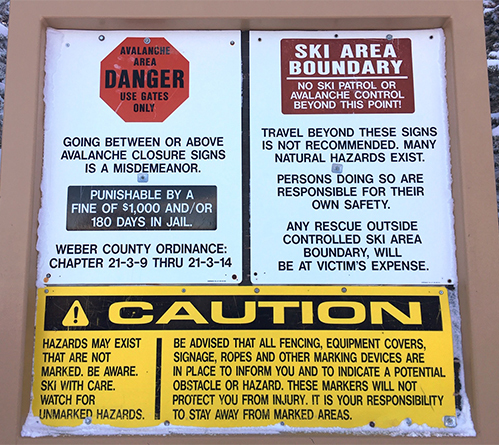 Safety considerations, maintenance or operational requirements, grooming operations, snowmaking operations, special events, avalanche hazard reduction work, wildlife or resource considerations, or construction, may cause public risk management issues to exist. To protect the public from potential hazards that may exist, prior to the opening of the ski season and postseason, the ski area is authorized, with Forest Service pre-approval, to close areas subject to those potential hazards and to post signs at typical uphill access points closing those areas. Complementing the Responsibility Code and it's 7 tenets, #RideAnotherDay promotes 3 actions every skier and rider can take to help keep themselves and those around safer on the slopes. These three actions are: 1. Be Ready 2. Stay Alert 3. Plan Ahead By doing these three things every run, you'll be helping keep the slopes safe and enjoyable, for you and everyone else.